The attack on Hambanthota people has exposed the government which marks two years of its existence says the Information Secretary of the JVP Vijitha Herath. He said this speaking at a press conference held at the head office of the JVP at Pelawatta today (8th). The Member of the Southern Provincial Council Sisira Wahalathanthri, Suranga of Collective to Protect Rights of People in Hambantota and its General Secretary Sumith Kumara also participated. Mr. Herath said, “Today, 8th January, completes two years of this government. When the government was formed people were given high promises regarding the economy, politics and democracy. However, after two years all hopes regarding ‘good governance’ have been shattered. The country has been dragged to a precipice economically and politically. The government has unleashed terror, violence and suppression instead of democracy. The resources of the people are sold dirt chap. People are burdened with heavy taxes. None of people’s wishes are being fulfilled. The statement that people’s earnings would be multiplied has remained only an empty promise. Ranil – Maithri administration takes over people’s lands arbitrarily to hand over to foreign companies. They do not want to develop people’s future. They do not want to dedicate themselves for people’s benefits. People have taken to the streets as their hopes have been shattered. Students took to the streets against the suppressive moves of the government. Farmers have taken to the streets. Now people have taken to the streets. The government deployed armed forces to tear gas, baton charge and shoot the masses who struggle for their just rights. It is the same repression that was unleashed on people at Hambanthota yesterday. People in Hambanthota made sacrifices for years to save their traditional lands. During Rajapaksa regime 11,000 acres of lands belonging to people in Hambanthota were arbitrarily taken over. This was said by Namal Rajapaksa in an interview with a weekend newspaper. Lands of the people were arbitrarily taken over for Maththala Airport, Mirijjawela Industrial project and Hambanthota Harbour. What Rajapaksas did then is repeated by Ranil – Maithri government now. Hence, people in Hambanthota have a right to save their lands from being sold to foreign companies. We accept that there should be industries in our country. However, people’s traditional lands should not be taken over arbitrarily for that purpose. Installing factories after arbitrarily taking over people’s lands would not be fruitful. What the government wants to do is to sell the lands to foreign companies on the pretext of establishing industries. This is how Ranil – Maithri government hopes to earn money. We demand from the government to immediately stop arbitrarily taking over lands of Hambanthot people and stop selling Hambanthota Harbour. If the government fails to do so the JVP will take action rallying thousands of people against it. Yesterday people in Hambanthota, without any party differences, launched a protest campaign against the government. People from all over Hambanthota joined the protest campaign. The government created a massive terror situation in the area. The Army and the police were deployed. Thugs from Mattakkuliya, Kurunegala, Galle, Matara and henchmen of ministers terrorized people from 6th night. The police blocked roads and set up barriers. This made people angry and they responded. The attack unleashed by thugs and the armed forces on the people in Hambanthota was a savage and inhuman attack. The government assaulted and attacked men and women who agitated to save their traditional lands from being sold dirt cheap to foreign companies. We condemn government’s attack with disgust. This struggle cannot be suppressed by attacks or terror. Hundreds and thousands of people will rise and rally against this government. A cold snap in Europe has left at least 23 people dead over the past two days, while the frigid temperatures are expected to drop even further over the weekend. Ten people have died so far in Poland where the last recorded temperature was as low as minus 14 degrees Celsius on Saturday. 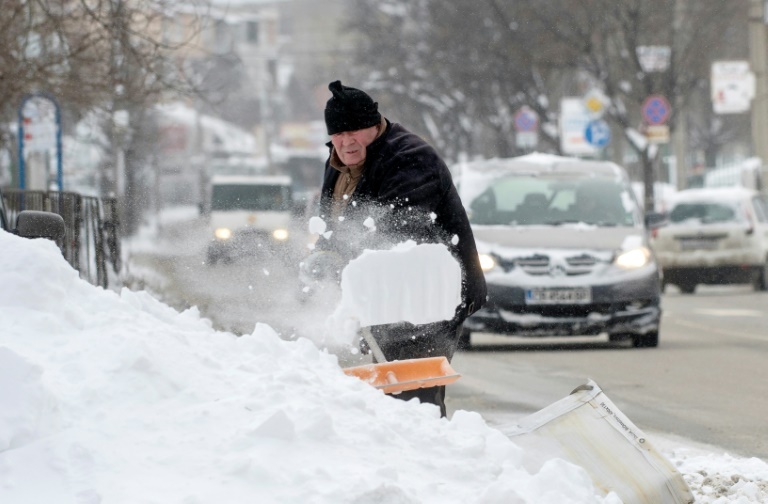 “Seven people died on Friday in what was the deadliest day this winter,” said a Polish government spokesperson Bozena Wysocka. “We recorded three other victims the previous day,” she said. “This takes to 53 the number of hypothermia victims since November 1,” she added. According to Italian authorities, over the past 48 hours, seven people, including five homeless persons, were killed by the severe cold. On Saturday morning, the airports at the towns of Bari and Brindisi as well as in Sicily were also forced to close down due to the cold. In the Czech Republic’s capital Prague, three people — two homeless people and a parking lot guard — also died. Meanwhile, temperatures in the Russia capital Moscow fell to minus 30, and to minus 24 in Saint Petersburg, where police uncovered the frozen body of a man who had died of hypothermia on Saturday morning. On Friday, the frozen bodies of two migrants were found by Bulgarian locals in mountains located close to the border with Turkey. In Turkey’s largest city Istanbul, 65 centimeters of snow was recorded forcing a large number of flights to be canceled. Shipping was also halted through the Bosphorus Strait by the snow and cold. He has received information that with the imposing of a controlled price for imported rice, the deceitful large scale rice businessmen are preparing to mix imported rice with rice that have been already declared unsuitable for human consumption says the National Organizer of All Ceylon Farmers’ Federation Namal Karunarathna. He said imposing a controlled price for imported rice would create several crises in the country. He said there would be issues regarding the standard of the imported rice. The Minister of Rural Economic Affairs P Harrison was apprised regarding the issues at the discussion held on the 6th but he did not show any interest pointed out Mr. Karunarathna. The attack on the people’s protest against handing over Hambanthota Harbour and 15,000 acres of people’s lands to China is condemned with disgust states a media release issued by National Bhikkhu Front. “We condemn with disgust the attack carried out, deploying the police, on the Maha Sangha and the people who protested against the treacherous betrayal of handing over the Hambanthota Harbour and 15,000 acres of lands that are equal to people’s lives to China for 198 years. National Bhikkhu Front contributes its blessings and strength to the militant people who participated at the protest and wish quick recovery for those who were injured and had to be hospitalized. These attacks are not unfamiliar to the leaders of the coalition government lead by Mr. Ranil Wickremesinghe. When the likes of Wickremesinghe, Chandrika, Mahinda and Sirisena who come to power on shoulders of the masses but turn their backs after coming to power, the masses who have not forgotten the suppression in the past and the present take to the streets not to demand power but for their rights. The people in this country including the Maha Nayakas have been deceived again and the agreement for the sacrifice has been signed today. However, the leaders of the country carrying offerings and worshipping Maha Nayakas promised such agreements would not be signed. 52 persons have been taken into custody on suspicion of damaging public property at the agitation held ignoring orders by Hambanthota Magistrate. The agitation was held against the laying of a foundation stone for the said investment zone at Hambanthota yesterday (7th). It is also reported that a special investigation is being carried out to arrest several others involved in the incident. However, no powerful politician has been arrested despite many were seen taking part in the agitation. Hambanthota Magistrate Manjula Karunarathna had issued a restraining order prohibiting persons from engaging in any protest or demonstration in or near the premises of the Hambantota Port. However, at a discussion held with Maha Sangha at Walawa Temple Prime Minister Ranil Wickremesinghe had ordered the Minister of Law and Order Sagala Rathnayaka to give necessary instructions to the police to withdraw the restraining order. The Prime Minister and Minister Sagala Rathnayaka had participated in the relevant discussion on the invitation of former Speaker Chamal Rajapaksa. The restraining order had been issued against 26 people including five Bhikkus, Mr. Chamal Rajapaksa and Parliamentarian Namal Rajapaksa.